As the name implies, the new 3 CIM Ball Shifter provides mounting locations for up to 3 CIM-style motors (or gearboxes with this same mounting pattern). This allows FRC teams to build drivetrains and mechanisms with even more power. Thanks to customer feedback, we've incorporated a number of subtle improvements into the 3 CIM Ball Shifter to ensure it is built for rigorous FRC competition. Note: A pneumatic shifting cylinder and fitting kit is not included in the Ball Shifter kit. Be sure to add these below in the "Pneumatic Cylinder & Fitting Options" category if needed. This gearbox provides the same Ball-Lock shifting method as the original Ball Shifter, but also allows users to change the shifting spread between high & low gears. This gearbox has three different shifter spreads: 2.16x, 2.65x, and 3.68x. This new gearbox features a lightweight plastic housing that includes the standard VEXpro mounting features for face mounting. In addition, it has hex-nuts embedded in its sides which also allow for edge mounting. The housing also includes internal features which will keep motor screws from dropping inside the gearbox while they’re being installed. 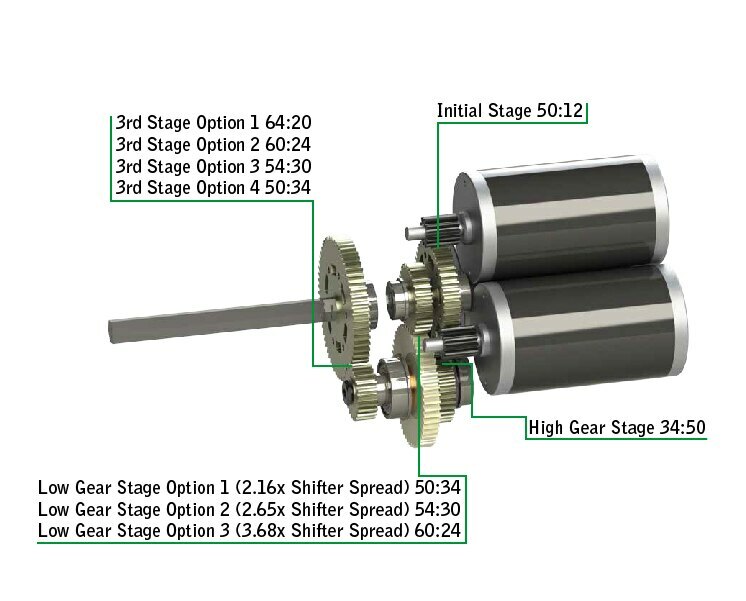 The 3 CIM Ball Shifter comes standard as a 2-stage gearbox, but includes options for designers to include a 3rd gear stage for larger reductions; in this setup designers can also customize the overall gearbox ratio by choosing between four different 3rd stage gearsets (64:20, 60:24, 54:30, 50:34). The 3rd stage output plate is shaped to allow for configurations in which wheels are directly mounted on the gearbox output shaft. This makes this gearbox well suited for West Coast-style drivetrains. The VEXpro 3 CIM Ball Shifter provides three different shifter spread options to teams. These options were chosen specifically to serve the needs of FRC designers. When designing an FRC drivetrain, teams typically try to ensure that the robot low-gear can survive a continuous pushing match (with high traction wheels) without tripping breakers. They then choose a high-gear which is "fast" enough to zip around the field, without being uncontrollable or accelerating too slowly. The three options provided allow teams to find a balance which makes their high gear as fast as they want it, and gives their low gear as much torque they need. Specification VEXpro Gears Require Lubrication. We recommend white lithium grease.